It's here TODAY. 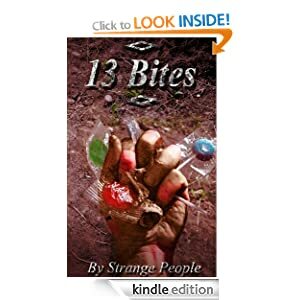 13 Bites is now published on Amazon worldwide as a kindle version. This has been a great experience for me working with other authors. Secretly I think some of them are a wee bit nutty but you have to have a sense of humour to live the life of an author. Stamina is the key word that comes to mind. Anyway, I digress and must return to the scary anthology of 13 Bites. Produced by many authors, this little book will most certainly give you the chills if nothing else. Pop along to Amazon and purchase a copy because all the proceeds are going to a charity that deals with children's literature.